Parent Volunteers are always welcome and appreciated! All volunteers with 18+ hours of service will receive a Discount Pass. 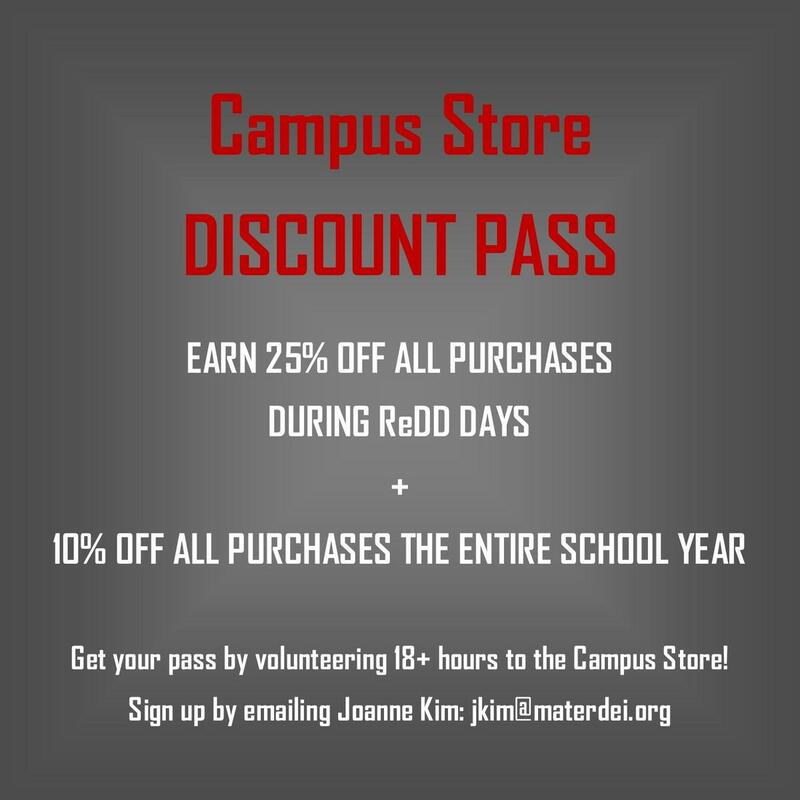 The Discount Pass gives a 10% discount on all purchases for the current school year. Parents can volunteer on a regular basis or just for special events. Special Incentive: 25% Discount Passes! Volunteers with 18+ hours of service between 7/23 and 8/3 will receive 25% Off Discount Passes in addition to the 10% Discount Passes! 25% Off Discount Passes valid between 7/26 and 8/7. Please keep in mind that this process takes about 2 weeks to clear. We would greatly appreciate if you can please plan for this processing time. Contact Mater Dei Fingerprinting at 714-540-6722 or fingerprint@materdei.org to set up an appointment for fingerprinting. Take our Safe Environment Training Class on https://orange.cmgconnect.org/ Create a new account, making sure to fill out all the fields. Under the affiliation section, please indicate that your role is Volunteer and "Safe Environment Training" is how you will be participating. Once complete, download the certificate with your name and submit it to fingerprint@materdei.org as a PDF attachment or bring it with you to your fingerprinting appointment. Email the Campus Store Manager with your availability. Please let us know if you would like to volunteer regularly each week during store hours, or for special events during the day/evening.